An Ugly Birthday Cake, but Pretty Cookies! | What Smells So Good? Sometimes the most sought-after things turn out to be some of the ugliest... I mean think of truffles, rough diamonds, and oil! When I set out this morning to whip up a birthday cake for one of my friends and bakery clients, Georgiana (of cheesecake and pumpkin pie fame), I was going in completely blind... this was a recipe I had completely invented off the top of my head, with only a basic vanilla cake recipe to go by, some special ingredients and a concrete idea of what I was looking for: coconut cake. I know that there are tons of recipes out there for the treat, from the most basic to the most intense, but I had some coconut flour and wanted to use it! Preheat oven to 350F. Grease and flour a 9" round cake pan. Sift together the flours, baking powder, salt and cornstarch. By hand, beat in sugar, coconut milk, water, vanilla, oil, and applesauce. Bake for 25-30 minutes, until tests done. 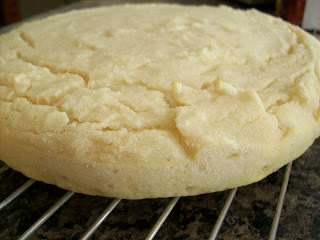 As you can see, it's not a beautiful, high, golden cake - in fact, it looks pale and quite sad. However, from the smell of it, the flavour will be spot-on. Though it isn't the beauty queen of the birthday cake world, it doesn't really matter anyway, since I have a delicious limey "butter"cream frosting to top it! Just to go with the cake's veganism, the frosting was made with stick margarine, but you purists can use the real thing! Cream margarine with electric mixer. Add lime zest. Gradually add sugar, beating well on medium speed. Add coconut milk and beat until light and fluffy. Refrigerated in an airtight container, this icing can be stored 2-3 weeks. Will I make this again? If she asks. I personally hate coconut! On a birthday-related sidebar, there's only 1 month and 2 days left until I turn 20! I can't believe it, I'll be OLD! (haha). I'm hoping for a birthday dinner at the Mongolian Grill again like last year's meal, which was awesome. I wouldn't say no to some good, fresh sushi though, or a trip to the St. Lawrence Market! 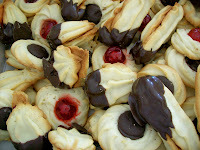 On a prettier note, check out the Spritz Cookies I made in class yesterday!! 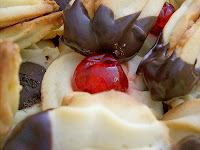 Lemony butter cookies, some sandwiched with raspberry jam and dipped in chocolate, others with chocolate or cherry centres! Beauty doesn't come easy, though, even in the kitchen... these were a total B*TCH to pipe out (and any of my classmates will agree), especially when piping isn't your forte anyway! They kind of remind me of the snarky pretty girls you see in teen movies... gorgeous to look at but so unbearable to deal with that you just can't bring yourself to! However, they smell so fantastic that I can't wait for my mom to take her share to work, or for my dad and Andrew to take theirs home, so I'm not tempted to make myself ill! By the way, for those of you looking for a cute way to say "hi" to your loved ones this Easter, check out some of these Easter Chocolates & Candies ecards. They're free (bonus!) and it's an easy way to pass along your good wishes when your relatives and friends are far away. Thanks to Jack Morris for pointing these out to me!